We’re entering into the part of summer in NYC when the subway platform feels like purgatory and getting dripped on by an A/C unit elicits a mix of disgust and perverse relief. If you’re in dire need of an escape but didn’t plan ahead enough to book an Airbnb months ago, there’s good news: A tiny weekend-house startup will help you get the hell out of the city with minimal effort and expense. Getaway builds extremely Instagrammable tiny houses (some as low as $99/night) and places them in the woods outside Boston and New York. The modernist mini-cabins were originally designed by Harvard Design School grads and are super-rustic, meaning there’s no Wi-Fi or TV. But there is everything you need to be comfortable, like a queen bed, fresh linens and towels, shower products, kitchenware, fans, and campfire provisions. 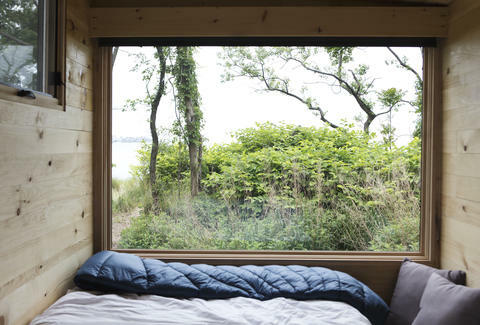 The majority of the cabins are located within two hours of the city, but this summer, the company has teamed up with Gateway National Recreation Area to install three tiny houses on New York harbor beaches. The locations are kept secret until after you’ve booked but they’re less than half an hour by car from Prospect Park, and also accessible by public transport. Check out this map of the Gateway National Recreation Area to give you an idea of where they might be. The cabins are situated a few steps from the beach and cost $150 per night. And unlike every beach house from here to Montauk, there’s still plenty of availability between now and Labor Day. That’s because the company blocked out half the calendar at the beginning of the season and releases a few dates every morning, which is great for spontaneous types and your commitment-phobic friend who always RSVPs to events as “interested.” Bookings are released at 10am every day, so set a calendar alert to check the Gateway website to make sure you nab one of these before summer’s over. Sarah Theeboom is a travel, food, and culture writer who wants you to always wear sunscreen. Follow her on Twitter or Instagram.